We all instinctively know that in order to achieve our full potential and be happy, we need to exercise our bodies and minds. We need fresh air and to have access to safe and healthy food. I would like to introduce you to the Vegan Organic Network and a new concept in farming. ‘Veganic’ is a combination of two words ‘vegan’ and ‘organic’. It’s a guarantee that the food is grown in an organic way with only plant based fertilizers, encouraging functional biodiversity so pesticides are not necessary. No chemicals, no GMO and no animal by products in any part of the chain. Did you know that more than 99% of the food you eat is grown using either agricultural chemicals or animal products? Yes, including your fruit and vegetables! Yes, even if it’s organic produce! This is because the fertilisers used in 99% of farms contain agricultural chemicals or fish, blood, bone or manure. This comes as a huge shock to many vegetarians and vegans to learn that they’re consuming animal products – and even a shock for the growing number of flexitarians, which are 33% of the population in the UK. Why are animal products used? These fertilisers are predominantly slaughter house by-products, used because they are abundant. This is obviously enormously problematic for those of us who don’t want to consume animal products or contribute to animal suffering, and don’t forget this fertiliser also includes all the hormones and antibiotics that the animals are given, which also ends up in our fruit and veg. Over 80% of antibiotics produced goes to livestock (http://www.sciencemag.org/news/2017/09/are-antibiotics-turning-livestock-superbug-factories) . Scientists know that Salmonella and E. coli O157 – a strain of E. coli that can cause serious sickness in humans – can spread to salads and vegetables if they are fertilised with contaminated manure. Here is the good news veganic farms a around the world are now producing super organic food, food that is clean, safe (no dangerous pathogens) and free from any animal inputs, chemicals or antibiotics. Veganic farming empowers small scale farmers around the world to use locally available resources to increase soil fertility and to become economically independent of industrial fertiliser and pesticides. It is also essential to reverse climate change and ensure a sustainable planet and healthy humans! Thinking of growing your own fruit and veg? Vegan organic farming and growing is achieved through wide crop rotations, systematic mixed cultivation, a careful and diversified tilling of the soil, the planting of hedges and flower strips as well as the creation of habitats within the growing area. It includes arable crop growing and small scale market gardening. Permaculture mimics nature’s patterns to create an abundance of natural resources. Incorporating holistic core ethics; Earth Care, People Care and Fair Shares. Where can I buy veganic fruit and veg? You can buy it at your local veganic farm and in some supermarkets in various cities around the world that label veganic products. 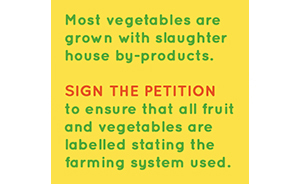 Alternatively support the Vegan Organic Network established in 1996, creators of the UK’s first certified veganic standards. 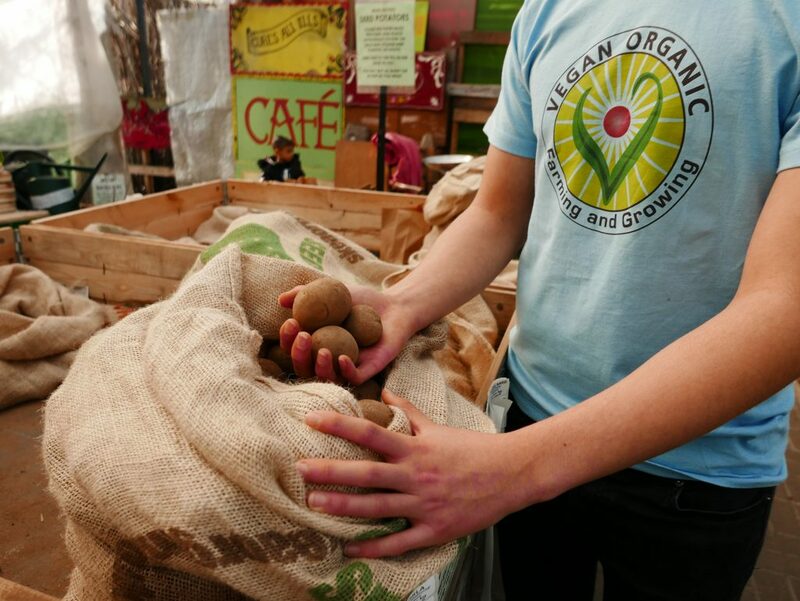 The Vegan Organic Network are working with and supporting farmers and growers in transition to veganic with advice, courses and bursaries to study. They deliver talks and training courses and raise public awareness of how food is grown. is organising the world’s first International Veganic Action Conference, bringing together growers, farmers and activists from around the world, with the objective of demonstrating that veganic food is resilient to the largest problems facing humanity, i.e. species extinction, environmental destruction , pollution of the sea and air and soil erosion. Support Vegan Organic Network for super veganic food and a green, clean, cruelty free planet. Remember to sign up for our free newsletter.